All ac power SPDs should be Listed or Recognized to ANSI/UL 1449 and installed in accordance with the manufacturer’s installation instructions. Non – listed devices may create a fire or personal safety hazard. Most commercial SPDs are hard wired to the facility electrical system. The primary function of the SPD is to eliminate short duration voltage spikes by diverting the excess voltage to ground. * ANSI/UL 1449-2014 (Fourth Edition) replaces ANSI/UL 1449 Third Edition. With regard to performance ratings associated with these standards, the differences are minimal. The changes are outlined below. SPDs are marked with a Voltage Protection Rating (VPR) that is obtained during the Nominal Discharge Current test using a 6 kV,3 kA Combination Wave Generator. The VPR marking replaces the (ANSI/UL 1449 Second Edition) SVR marking. It should be noted that the VPR is obtained using a much larger short-circuit surge current. SPDs are marked with a Nominal Discharge Current Rating that is verified to ensure that the SPD is fully operational when subjected to 15 surges at the marked level. Nominal Discharge Current Ratings include 20 kA, 10 kA, 5 kA and 3 kA, and depends on the “Type” of SPD. SPDs are marked with an SPD “Type” that indicates where the SPD can be installed within the electrical system. For more information on SPD Types go to Reference Materials. The Fourth Edition of ANSI/UL 1449 added Photovoltaic (PV) DC (Direct Current) SPDs, up to 1500VDC. Previously only AC (Alternating Current) SPD’s up to 1000VAC were in the scope. One important aspect of SPDs that is often misunderstood is the difference between a “listed” SPD and a “recognized component”. A listed SPD is one that has met all of the requirements of the ANSI/UL 1449 standard (regardless of the edition). A recognized component SPD is one that may not have been subjected to all the requirements of the ANSI/UL 1449 standard and is assigned “conditions of acceptability” (CoA). The customer / installer should be aware any CoA, as if they are not followed, a hazardous condition may be created. Contact the SPD manufacturer to determine if any CoA exist. When a suppression component fails, it most often does so as a short, causing current to begin flowing through the failed component. The amount of current available to flow through this failed component is a function of the available fault current and is driven by the power system. Fault current conditions occur during short-circuit episodes in a distribution system. For example, suppose the insulation on two, phase conductors is failing. If the conductors come in contact with each other, a large amount of current will flow through this touching connection or short. During this “phase fault,” or “phase short,” large levels of current – possibly over 100 kA– flow through the conductors, fuses, circuit breakers and any other devices connected in the fault path. 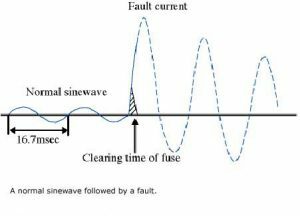 Unlike surge currents that occur in microseconds, faults can last a quarter cycle or even longer. Electrical distribution system components such as circuit breakers, panelboards and fuses are assigned fault amperage interrupting capacities, or Available Interrupting Current (AIC) ratings. These are electro-mechanical ratings that assess the device’s ability to maintain integrity if a fault condition occurs downstream of the protection device. For example, a 10 kAIC-rated circuit breaker can safely interrupt 10,000 amps of fault current without blowing apart or internally short circuiting. A 65 kAIC switchboard must mechanically sustain 65,000 amps of fault current flowing through the switchboard and remain undamaged. These fault current ratings can be determined by consulting the manufacturer’s data sheet and are most often listed on the protective device. The short-circuit current rating of an SPD is defined as the level at which a surge-protective device (SPD) is suitable for use on an ac power circuit that is capable of delivering not more than the declared root-mean-square symmetrical current at a declared voltage during a short-circuit condition. While no credible manufacturer would deliberately design a product to fail, the potential for malfunction exists in all electrical devices. It is critical that failures, regardless of how infrequently they occur, minimize damage and present no risk of personal injury. The purpose of coordinated overcurrent protection in an SPD is to ensure that in the event of a fault, the device can safely and promptly remove itself from the electrical distribution system. For products manufactured without inherent fault current protection, such protection should still be provided. This can be accomplished by installing the devices via an external fusing system or circuit breaker. By incorporating coordinated fault current protection, the SPD will be removed from the rest of the distribution system if the suppressor experiences a fault condition or failure. For additional information regarding AIC ratings and SCCRs of SPDs, refer to ANSI/IEEE C62.72-2007. If no overcurrent protection is in place to take the failed protection device off-line, the fault will seek another upstream overcurrent device to clear. Often the alternate is the main breaker of a branch panelboard or service entrance switchboard, depending upon the location of the surge protective device. Properly coordinated overcurrent protection allows the SPD to remove itself from the distribution system under all fault conditions without catastrophic consequences to the device or other connected loads. While often times confusing, the selection of a surge protective device must include a basic understanding of the differences between surge current and fault current. Also essential to the selection process is knowledge about the application of an SPD, the intended installation environment and the device’s operating characteristics. Understanding these informational building blocks will help ensure a well-designed protection system.